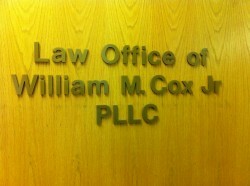 The Law Office of William M Cox Jr PLLC website is provided as a public resource for general information about our firm. Nothing provided nor disclosed through this website should be considered legal advice. As such, you should not act or rely on information disclosed or provided through this web site. While the Law Office of William M Cox Jr PLLC uses reasonable efforts to include accurate up-to-date information on the site, the firm makes no warranties or representations as to its accuracy. The Law Office of William M Cox Jr PLLC assumes no liability or responsibility for any errors or omissions in the content on the site. The use and browsing of the site is at your own risk. The Law Office of William M Cox Jr PLLC assumes no liability for any direct, incidental, consequential, indirect, or punitive damages arising out of access to or use of the site. This website, including any inquiries that you send to us, does not create an attorney-client relationship between you and the Law Office of William M Cox Jr PLLC, nor is it intended to do so. Do not send via e-mail any confidential or privileged information about any legal matter that may involve you until the Law Office of William M Cox Jr PLLC has decided to represent you. Nothing on this website shall be construed as conferring any license under any intellectual property right, including any right in the nature of trademark or copyright, of the Law Office of William M Cox Jr PLLC or any third party, whether by estoppel, implication, or otherwise. All trademarks and trade names are the property of their respective owners. Except as otherwise noted the Law Office of William M Cox Jr PLLC is the owner of all trademarks and service marks on this website, whether registered or not. All rights not expressly granted herein are reserved exclusively and entirely to the Law Office of William M Cox Jr PLLC. The Law Office of William M Cox Jr PLLC may at any time revise these Terms and Conditions by updating this posting. Users are bound by any such revisions and should therefore periodically visit this page to review the current terms and conditions. The Commonwealth of Kentucky requires that law firms add the statement “THIS IS AN ADVERTISEMENT” on publications of this nature. This publication is intended for general information only and not as legal advice. You should discuss specific details with your attorney to determine how legal developments may apply to your situation.